When you get home after a long day, the one thing you would love is for your garage door to open remotely. What if you lost your remote or the opener does not want to comply due to malfunction or other reasons. One of the best things you can do for yourself for peace of mind is to get an inexpensive garage door opener remote. There are various top features you can look at such as universal remotes, remotes that works via Wi-Fi, has a long battery life, etc. we did all the hard work for you and bring you the top 10 best keypads and remote garage door opener. The MC100-P2 works with most brand like Genie, Craftsman, Lift Master, Chamberlain and more. It is a small and compact keychain opener and it is a simple to programs and operate opener with a lithium ion battery. Twin button design that will control MyQ enabled lights, open entry gates and garage doors too. With the MyQ Smart you have all the advantage of opening your garage door with Wi-Fi enabled and wireless capability. Did you forget to close your garage door, you can do so from wherever you are via your smartphone or allow visitors entry while you are not at home. You will in addition be alerted whenever your garage door opens or closes which makes it ideal for large and busy families. It is in addition compatible with almost any garage door brand. The KLIK3U from the Chamberlain Group is one of the best universal garage door remotes and it is compatible with any one of the top manufacturers of garage door openers. You use only a single button to program and operate it too even though it is a two-button remote. Brands that are compatible with the KLIK3U include Lift Master, Chamberlain, Craftsman, Wayne-Dalton, Overhead Door, Stanley, Linear and Genie. The Genie Master uses Intellicode technology that works on all genie garage doors. It is a three-button remote that allows you to access your garage while the Intellicode will change the present code to another thus safeguarding you from unwanted access. 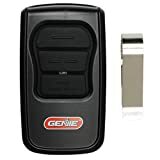 Any other Genie product and gate can be opened too and programming the remote is simple with detailed and easy to understand programing codes included. With the 953EV-P2 you can open and operate three Craftsman, Liftmaster and Chamberlain garage doors. It is ultra-convenient with a long-life lithium ion battery and clip too. It can open more than garage doors, but in addition control accessories including MYQ lights. When you have more than one car it is ideal as additional remote or replacement for lost remotes too. You will see when it is in operation with the indicator light showing in colors of red, orange, green, yellow and purple. The Linear 3089 is not universal, however you are capable of opening any US Multicode garage door or gate. This Liner model is handheld and backed by a one-year warranty and opens any product that is Multi-Code 300MHz. it is compact but easy to use and comes with a nine-volt battery, visor clip, button and ten dip switches. 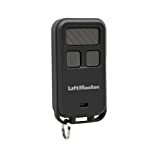 The 890max from LiftMaster is certainly one of the most compact and smallest garage door openers that will fit into any pocket or small purse and very suitable to wear on a keychain. 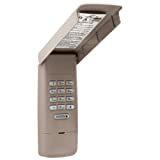 With this remote you can open garage door openers, gates and MYQ for up to three at one time. It has enhanced functionality and performance with the use of security +2.0 rolling code technology. It comes with battery includes, a keychain and easy to push programming. The 371LM from Lift Master appears very basic at first glance, especially when you notice its single button operation and simplicity. However, it is very far from basic as you are capable of not only open your gate or garage door but in addition turn on small appliances and lights in your home too. 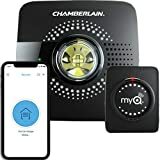 It comes with top features like purple antenna on its motorhead and purple learn button as well as Security+ rolling code that continuously send out a new signal after each time you use it to open the garage door. The Universal KLIK1U programs very easily and you can open nearly any garage door brand. You are capable of combining two remotes in one as it is capable of operating two frequencies simultaneously. 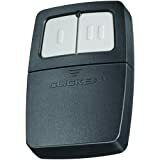 It is very user friendly and often used to replace a lost remote and remains a top choice in best garage door openers. It operates simply using rolling code technology of Security +2.0 for enhanced performance and opening garage doors without fail. With the Lift Master you can close and open all Lift Master garage doors without key or additional remote. It is Lift Master’s number one best seller for its outstanding price and top features as well as simplicity of use. Either use it to open a door or use it preprogrammed to allow delivery or visitors to enter without key. You simply program it with full easy to understand programming and give code for entry to visitors. It uses a four-digit coding that you can change each time you use it too. We conclude the top 10 best keypads and remote garage door opener by giving you a range of keypads and remotes for garage doors that have all the top features you are looking for. Each one will give you peace of mind that you will always be able to control your garage door while others also have additional features like controlling other gates and appliances.